Liver Cancer- Cancer that occurs on the surface or in internal parts of liver is called “Hepatic Cancer” or simply “Liver Cancer”. Liver is one of the large internal organs found in vertebrates. It performs crucial functions in digestion, metabolism, synthesis of proteins, storage of additional consumed food, detoxification and supports in excretion. It appears to consist of two lobes when viewed externally from above, one is about more than double the other in size. But a view from below reveals four lobes. It is situated in the right side below the rib cage and beneath the diaphragm in human body. All the types of cancer that affect liver are not liver cancer. 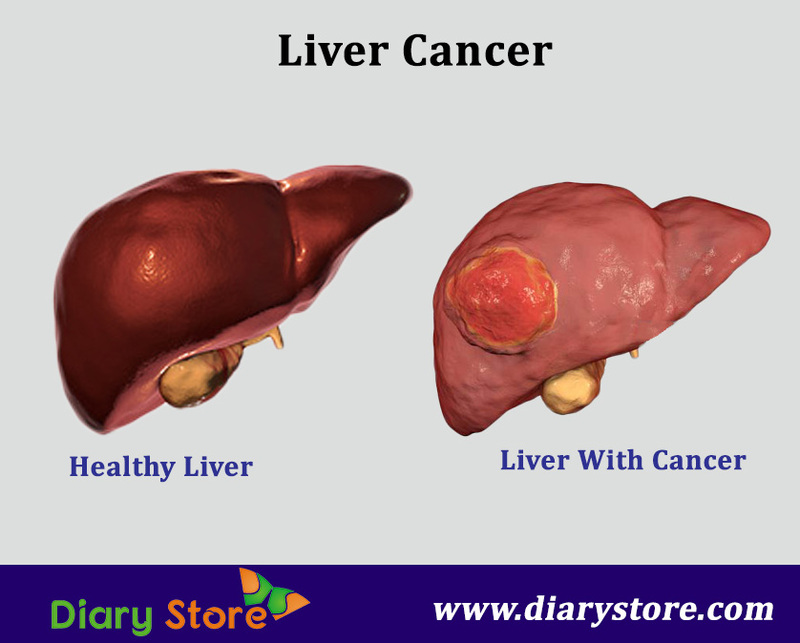 Any type of cancer which originates from other parts of the body and later spreads to liver is considered as metastatic to liver, but not termed as liver cancer. For example, the cancer that has begun in lungs and subsequently invaded to liver is still called “lung cancer” but not liver cancer. Most of the cancers that spread to live from other parts of the body are more common than liver cancer, arising from liver itself. The types of liver are categorized on the basis of nature of cells that become malignant. Hepatocellular Carcinoma (HCC) – This is also known as “Hepatoma”. 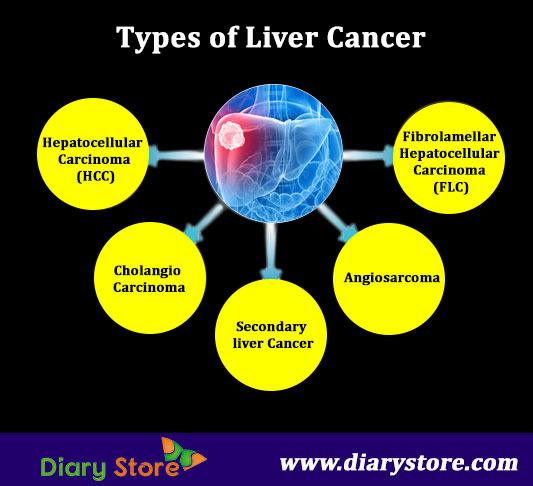 When the main type of liver cells called hepatocellular cells turn cancerous, the ailment is called HCC which is the most common variety of liver cancer, accounting for 75% of all types of liver cancer. Hepatoma is very often caused by the major problems of liver like cirrhosis, hepatitis-B, hepatitis-C.
Fibrolamellar Hepatocellular Carcinoma (FLC) – This is a very rare type that usually attacks generally pubescent boys or girls. FLC is known to have a single method of treatment of liver resection surgery in the initial stages before it progresses into metastatic stage. The chances of survival are better in case of young adults because after surgical removal of the cancerous part of liver, the functioning of liver is restored after two to three weeks and regaining of normal size of liver is possible after three to six months. Cholangio Carcinoma – This is also referred to in simple terms as “Bile Duct Cancer”. Cholangiocarcinoma affects the small narrow tube-like structures that carry bile juice to the gall bladder. If this type of cancer affects bile ducts within the liver, it is called Intrahepatic Cholangiocarcinoma whereas the cancer that develops in bile ducts outside the liver, it is known as Hilar Chorangiocarcinoma and if the bile ducts in close proximity to small intestine become the starting places of cancer, then the complication is referred to as Distal Chorangiocarcinoma. Angiosarcoma – Also known as Hemangiosarcinoma, this starts from the blood vessels of the liver and develops rapidly. Dignostic tests identify this type of cancer in advanced stages rather than in initial stages. However, this is one of the rare types of liver cancer, occurring in one out of hundred cases. Secondary liver Cancer – This type is better understood as metastatic cancer which has spread to liver, originating from other parts of the body. Most types of secondary liver cancer have their roots in colon. More than fifty percent of colorectal cancer patients are also found to have been the victims of secondary liver cancer. The treatment of liver cancer depends in its nature, the extent of spread/metastasis, the age of patient, the patient’s medical history and the symptoms of liver cancer observed in the victims.